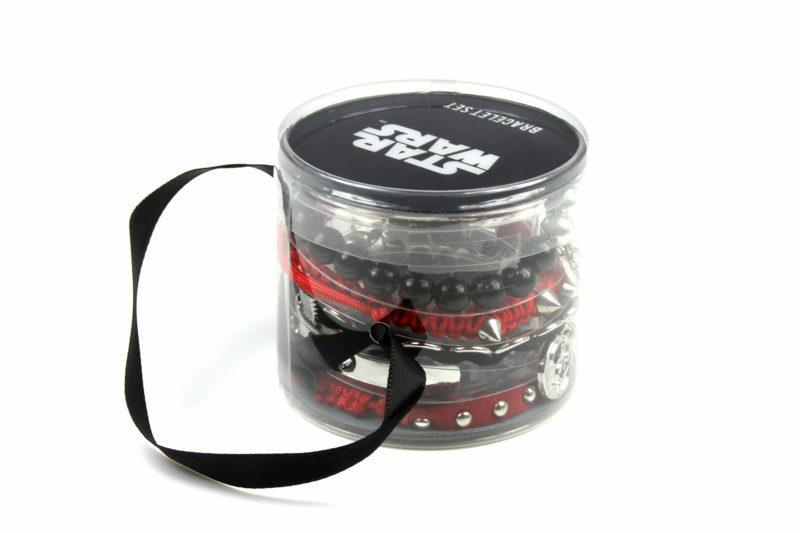 Today’s review features the Bioworld x Star Wars The Last Jedi bracelet set. Featuring five different bracelets, the set has lots of great details – faux suede, metal studs and spikes, rhinestones, beads, and dangle pendants! Inspired by the planet Crait, the red, silver, and black colour scheme goes with so many outfits – the perfect accessory set for a Resistance themed ensemble. 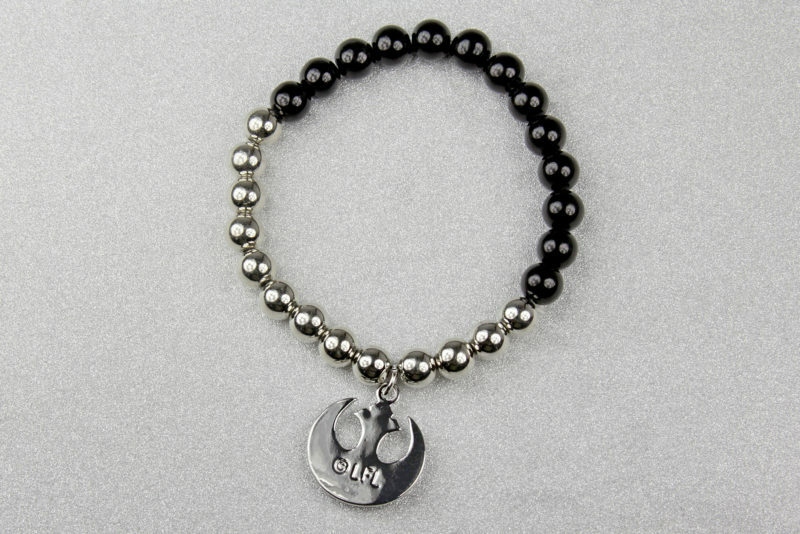 Wear your rebellious nature on your wrist, so to speak, with this terrific Star Wars: The Last Jedi Rebel Arm Party Bracelet Set featuring the symbol of the Rebellion, the word “Resistance,” and more! 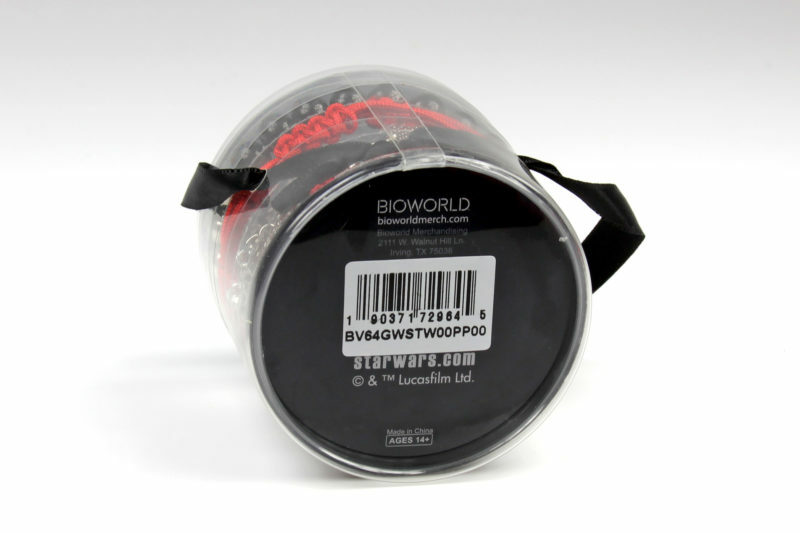 The bracelet is available from a number of Bioworld stockists – prices range from US$14.97 to US$18.31 per set. Shipping polices vary by seller – overseas customers can order via a mail forwarding company. The bracelet set came packaged in a short clear plastic tube. The top and bottom of the container is black, with the Star Wars logo on the top, and the copyright information and manufacturer details on the bottom. 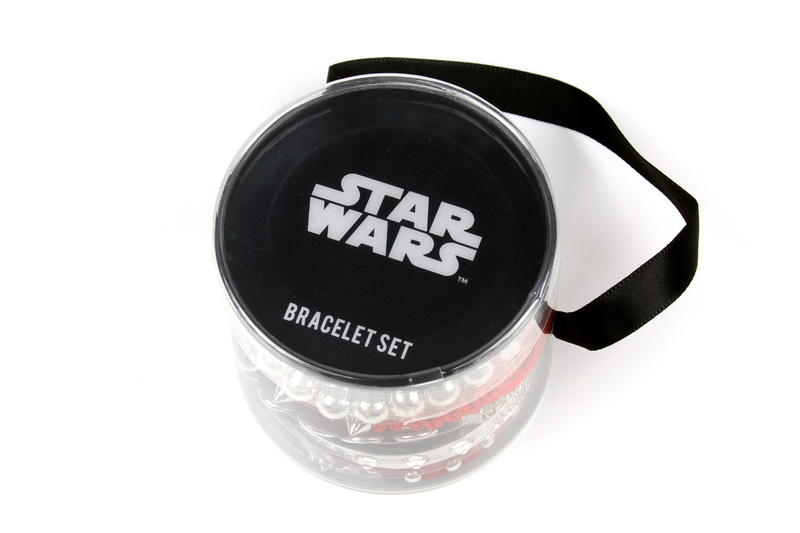 This set is made by Bioworld, a licensed Star Wars apparel/accessory company. Inside the plastic container, the bracelets are packaged in layers, with a clear plastic ‘donut’ shape divider between each bracelet to keep them spaced apart. There is a clear plastic tube in the center, to help keep the bracelets in place. The container also has a short loop of black ribbon attached, possibly to hang the container on racks in a store. The packing doesn’t note the materials, but the Amazon website listing notes this as being made from ‘Zinc Alloy/PU’. 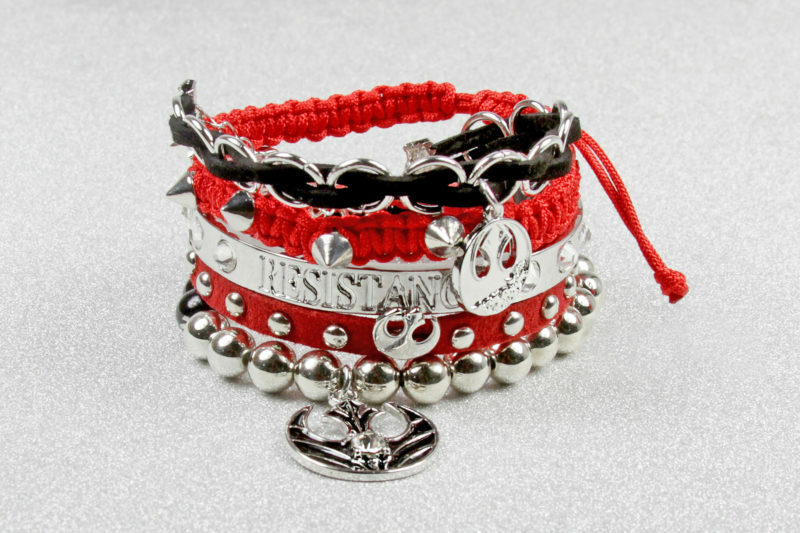 The Star Wars The Last Jedi Resistance ‘Arm Party’ bracelet set includes five bracelets – three bracelets feature a Resistance/Rebel ‘starbird’ symbol, one bracelet features the text ‘Resistance’, while the fifth bracelet is not Star Wars themed. 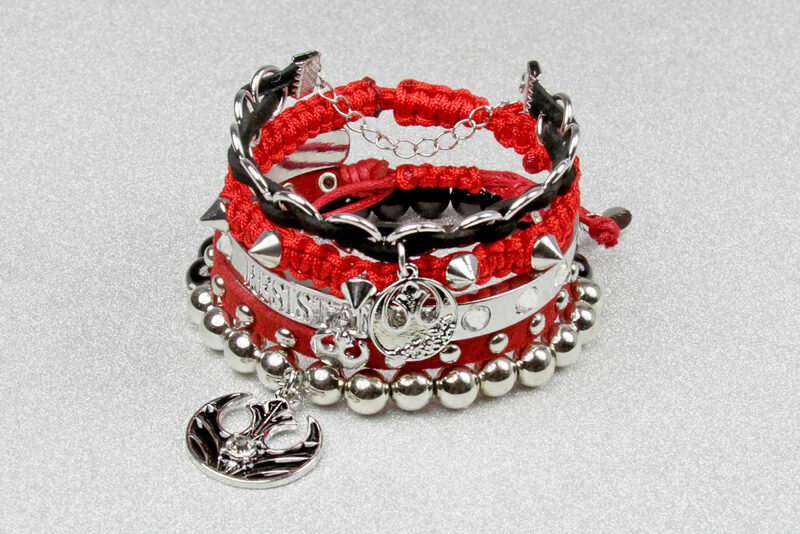 The colour scheme for this bracelet set is red, black, and silver. One thing I noticed straight away – the red colour is nothing like it appears in the promotional images. The advertising shows the cord and faux suede bracelets as being purple/burgundy – these two bracelets are very much bright red in person. The advertising posters/imagery for The Last Jedi used red quite prominently, so I understand the red bracelets in this set – but it is a little unfortunate that the advertising photos do not reflect the colours accurately. It is something to be aware of if the purple tones were a selling point for you. 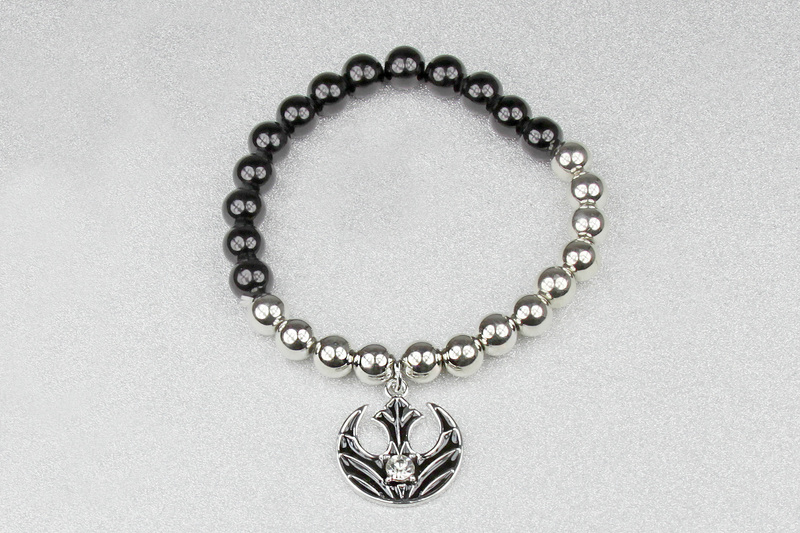 The beaded bracelet features silver-tone and black plastic beads on an elastic band. The beads feel nice, not as light as I was expecting. There are 13 silver-tone beads, and 13 black beads – exactly half and half. 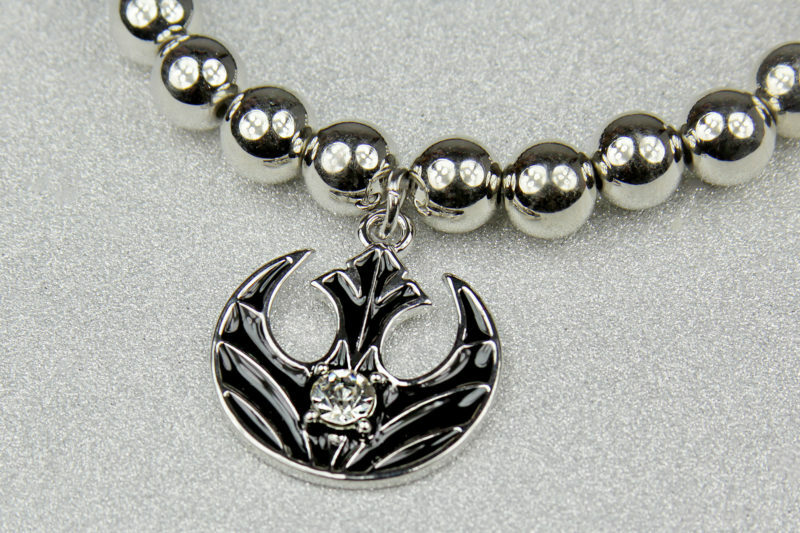 The Resistance ‘starbird’ symbol pendant is hanging from the elastic band, between the fourth and fifth silver-tone beads. I am a little curious about the placement – it feels a little random, compared to say, at the join between silver-tone and black beads. Though of course this placement is more interesting, and does fit with the Resistance being on the ‘Light Side’. The Rebel symbol pendant is really pretty in person – my favourite detail from this set. Seriously, I need matching earrings and a necklace with this pendant! The Rebel symbol is cut out, with raised detail lines which match the Art Deco style design used for other The Last Jedi accessories. The pendant is filled with gloss black enamel, and a single clear rhinestone is fixed in the center. The pendant measures approximately 2.1cm tall (not including hanger ring) – the back is flat, and stamped with the Lucasfilm copyright text. This bracelet fits a little loose at my natural wrist, so it tends to move a little when worn on its own. Personally I prefer elastic-based bracelets fit a little loose – a tight fit tends to expose the elastic when worn, which isn’t very pretty. The elastic is more for stretching over your hand to put the bracelet on. Unstretched, the bracelet measures approximately 18cm (internal circumference). When it arrived, the elastic knot was sticking out between two beads, but you can carefully tuck it back inside a bead. The next bracelet is made from silver-tone rings and two black faux suede strands. The faux suede strands are woven in an alternating patten through twelve rings, holding them in place. A silver-tone Resistance symbol pendant is attached at the center of the bracelet. This pendant is smaller than the one on the beaded bracelet, and is plain silver in color. 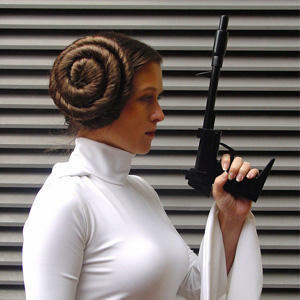 It has cut-outs, but the outer rim forms a complete circle – this gives a more secure base for the hanger ring, rather than the fine tip of the starbird symbol. The front of the pendant has recessed detail, and an area of speckled texture – this may look like a defect, but it is a decorative style inspired by the salt planet Crait from The Last Jedi. Other versions of this symbol often use red and white to convey the inspiration (like the hoodie in this recent ThinkGeek collection), which is definitely easier to recognise. The pendant measures approximately 1.5cm tall – the back is flat and stamped with the Lucasfilm copyright mark. The ends of the faux leather strands are clamped together in a silver-tone metal jewelry clamp at each end. One end has a length of silver-tone adjustment chain, while the other end has a silver-tone ‘lobster claw’ style clasp. The bracelet itself measures 15.7cm long (including clasp) – the adjustment chain adds another 5cm in length. 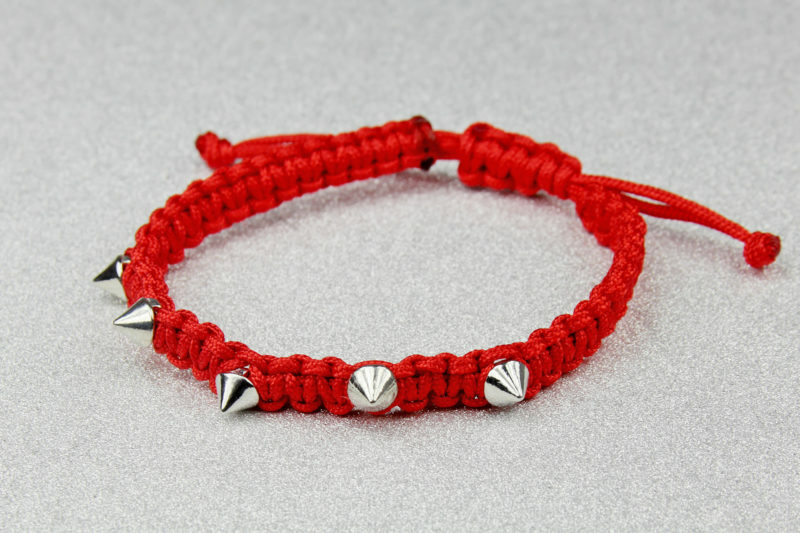 The next bracelet is made from red faux suede, with silver-tone metal studs. The bracelet has a sixteen small domed studs, set securely through the fabric. In the center, there is a small silver-tone metal Rebel ‘starbird’ cutout symbol. As you can see on this bracelet, the Rebel symbol stud is attached on a slight angle – it doesn’t point straight up, it is off to the right a little. Because studs ‘clamp’ onto fabric when attached, the symbol can’t be adjusted/rotated. This symbol appears straight on the advertising photos, so it is just a variance – I don’t mind it really. It is more noticeable if I wear the bracelet on its own, but when worn with the set all together, the placement mixes with all the other details and doesn’t stand out as much. The ends of the faux suede band are tied with cord, which forms the adjustment slider. The bracelet adjusts with a a segment of braided cord holding the two ends – you simply pull the bracelet wider to adjust larger, or pull the cord ends to adjust the bracelet smaller. The ends of the cord are tied in a knot – one end also features a small silver-tone pendant which is stamped with ‘©LFL’ on one side. At the smallest setting, the bracelet measures approximately 18cm (internal circumference). Next is the silver-tone metal bracelet. 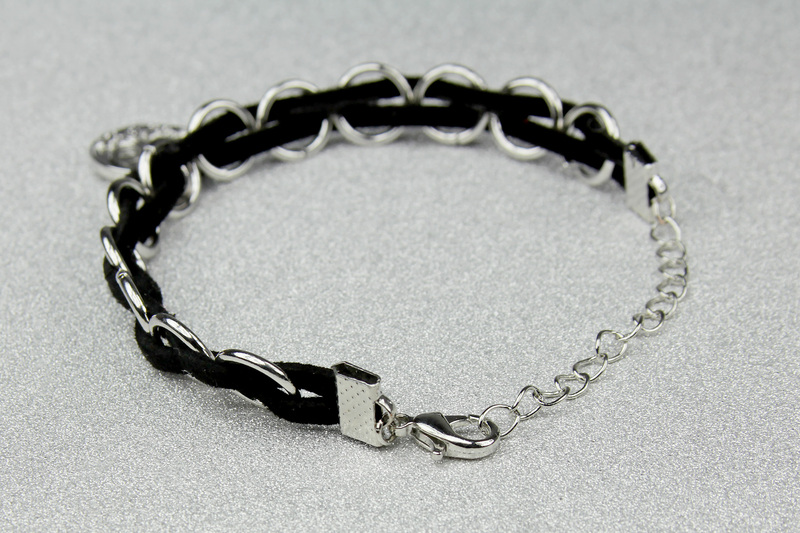 This is the only rigid-shape bracelet in the set – and it is very rigid, it has no flex. 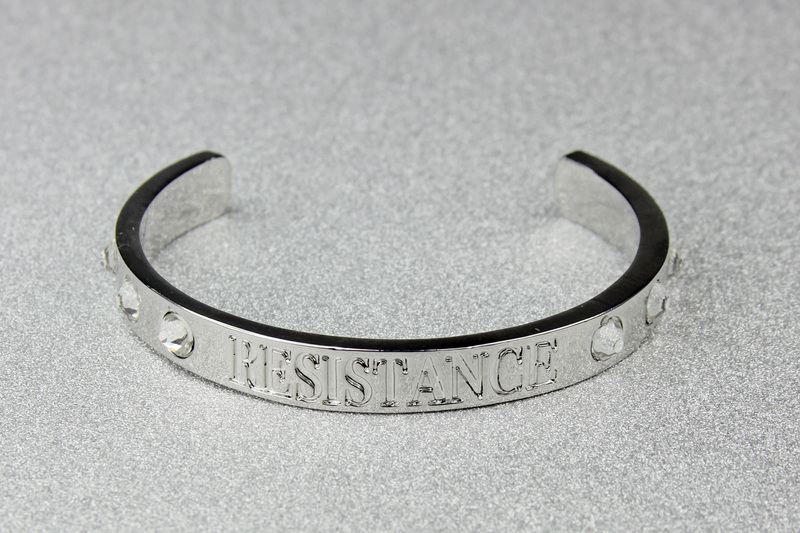 The front features the text ‘RESISTANCE’ in a recessed design, with three clear rhinestones on either side. The rhinestone bases are recessed into the bracelet as well, rather than attached to the surface (hopefully this means they are glued on well, I hate loosing rhinestones). This is the smallest bracelet in the set, as it has no size adjustment. To be honest, looking at the size, I wasn’t sure I would be able to get it on my wrist, it looks quite small in person. With the size of the gap, I was able to easily get it on my wrist – but it is definitely a small bracelet. Some fans won’t be able to wear this one, depending on wrist size, which is a shame. The bracelet measures approximately 13cm around (end to end inside, not including gap), while the gap measures approximately 3.9cm straight across. 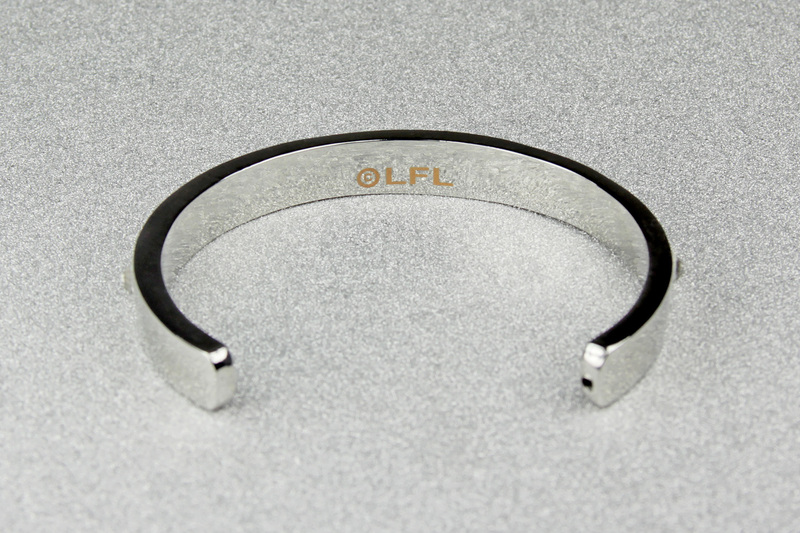 The metal bracelet has flat edges, not rounded – the ends are curved to avoid pointed edges. There is a small hole in one end of the bracelet – I believe this means the bracelet is hollow (rather than solid), to reduce weight because of the thickness of the band shape. 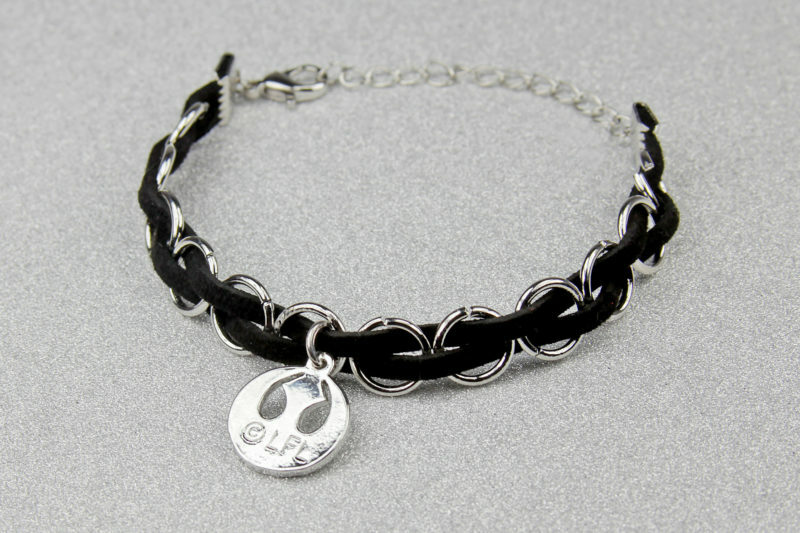 The inside of the band has the Lucasfilm copyright text ‘©LFL’ in a contrast colour. I can’t tell if this is printed or lightly etched – I can feel the texture when I run my fingernail over it, but can’t feel it against my skin. 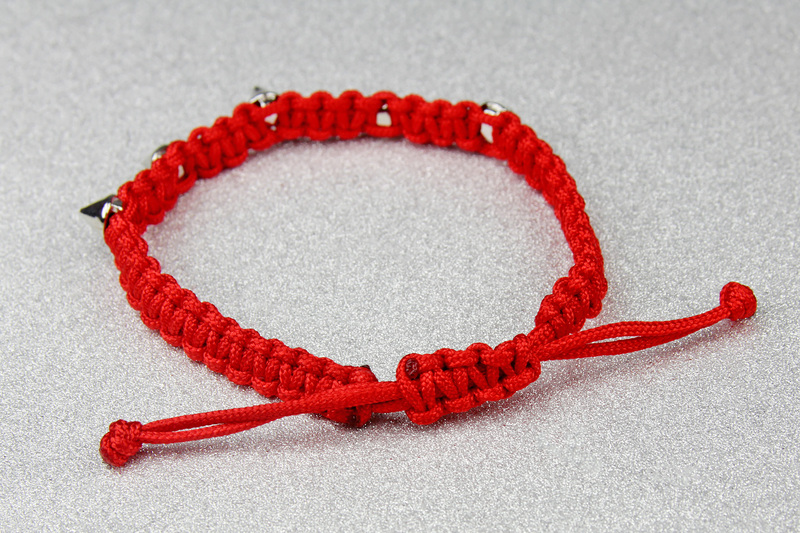 Lastly, the red cord braided bracelet. 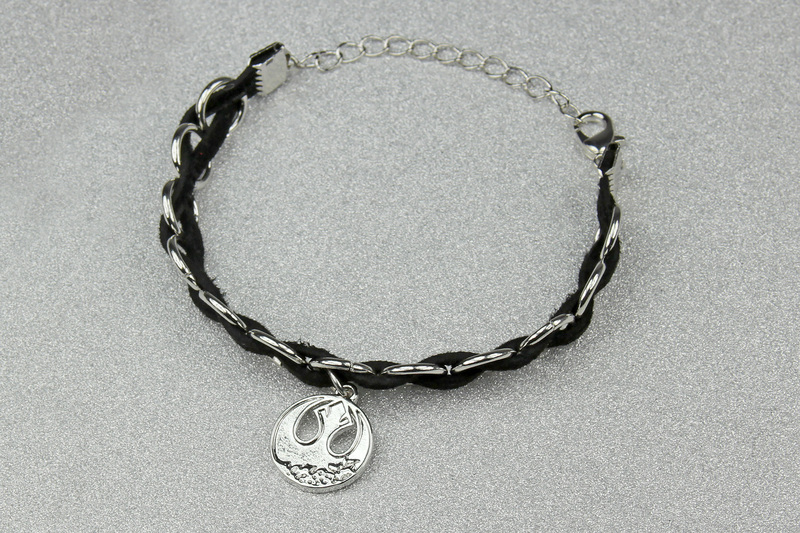 This is the only bracelet in the set that doesn’t have a Star Wars theme, it is just to complement the set. 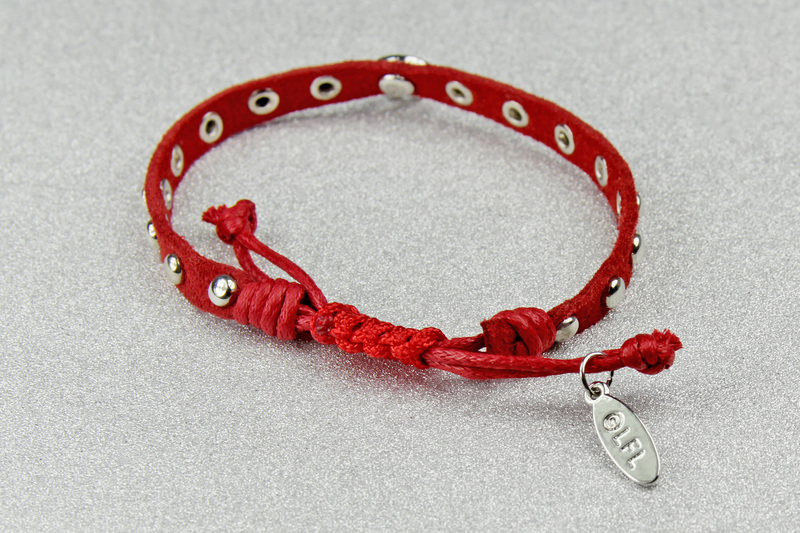 The bracelet is made from red synthetic cord braided in a tight pattern. The bracelet has five silver-tone metal spikes – these don’t feel sharp enough to scratch your skin, but I wouldn’t want the points pressed too hard against me either. The red colour of the braid is brighter than the red faux suede, but when wearing all the bracelets together, the colours work well. As with any bracelet set, you can choose which bracelets you want to wear together, so you can mix and match with the silver-tone/black bracelets if you prefer not to mix red tones. The ends of the cord are melted, to seal the fibres and prevent fraying – the very ends of the cords are also tied together in a knot. This bracelet is adjustable, in the same way as the faux suede bracelet – you simply pull the bracelet wider to adjust larger, or pull the cord ends to adjust the bracelet smaller. At the smallest setting, the bracelet measures approximately 18cm (internal circumference). The metal spikes are braided into the bracelet, not punched like studs – the cords are passed though a metal loop on the underside of each spike. This means the spikes sit a little differently to each other, as they are not attached to a flat surface, but they are held very securely. The spacing between each spike is pretty even – they add a fun detail to the bracelet set. While the red colour wasn’t what I was expected, I do like this bracelet set. 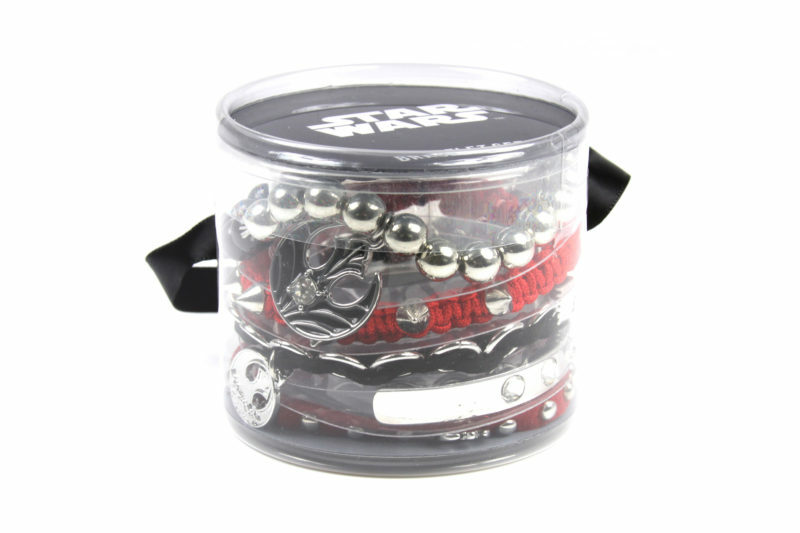 I alway love wearing Star Wars bracelets, and this set has five of them! I know I’ll wear some of them more than others (I especially like the beaded bracelet), but they do look great worn all together. It is a shame the metal bracelet is not larger, I think I would have preferred another soft/adjustable bracelet (like a black faux leather band etc), but it does add a great touch of sparkle to the set. I would love to see a First Order version for the Dark Side fans!